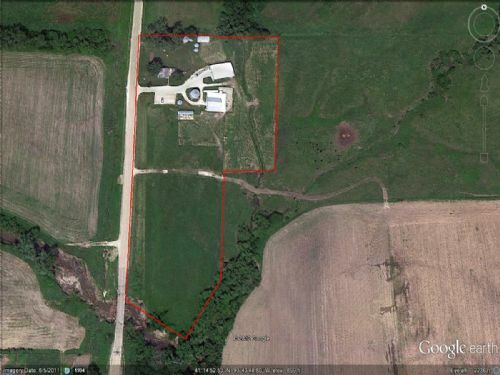 Outstanding country acreage. 3 bedroom, 1.25 bath 1 1/2 story home set on 7.13 acres. This home features an updated oak kitchen with lots of cupboard space and beautiful original woodwork. The home is serviced by rural water and natural gas which makes for affordable utility bills. In addition there is a working well that is hooked up to multiple hydrants around the property. The outbuildings on this property are in great shape. They include a 50 x 70 ft metal building (built in 1997), 60 x 60 ft barn, 14 x 30 ft barn, and a couple other smaller buildings. Most of the fencing on the property is newer and is setup into multiple lots for grazing horses, cattle, etc. An added bonus is the grain bins on the property. The owners receive a payment in exchange for renting these to a local farmer. This property is conviently located on a hard surfaced road for easy access to bigger cities.